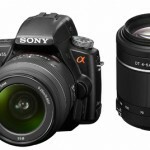 After the a33, now also the Sony a55 camera ($799.99) is no longer in production according to DCWatch. The Sony a33 and a55 translucent DSLR cameras were announced back in September of 2010. Sony Japan has issues a statement that their latest Alpha 33 and Alpha 55 translucent mirror cameras can overheat during video recording, in some conditions even after 6 minutes: Yesterday Sony announced that they will be outsourcing their image sensors to Fujitsu. Not sure if both news are related. Sony Alpha33, Alpha55, Alpha 560 and Alpha580 are now official. See the detailed coverage at: The pellicle mirror explained Sony A55 review Sony A55 preview field report Update: B&H are now taking pre-orders for the new Alpha 33, Alpha55 and Alpha 560 cameras. AmateurPhotographer just posted an article about the new Sony Alpha 33 and Alpha 55 cameras. Check it out before it gets removed.